Ok – as promised I show you some pictures of the Scrapbooking Convention in Middelfart Denmark. It was so cool. 170 People and 9 shops – 6 classes and an amazing organization. All that just 1 hour across the German Border! OK – nun wie versprochen ein paar Bilder von der Scrapbooking Convention in Middelfart, Dänemark. Es war so cool. 170 Leute und 9 Shops – 6 Workshopkurse und eine phantastische Organisation. Und dies alles nur eine Stunde von der Deutschen Grenze entfernt! We arrived on Friday before the start – and the set up was still in progress. Wir sind Freitag vor der Messe angekommen und alles war noch im Aufbau begriffen. There was a midnight crop with Bingo – and we had a lot of fun! Es gab einen Mitternachts Crop mit Bingo und wir hatten eine Menge Spaß! Early in the morning the hall filled up pretty quickly. Am frühen Morgen füllte sich die Halle dann recht schnell. And the workshops began in the workshoprooms. Und die Workshops begannen in den Workshopräumen. Little sneak into Christianes first Workshop. Einmal kurz reingelinst in Christianes Workshop. 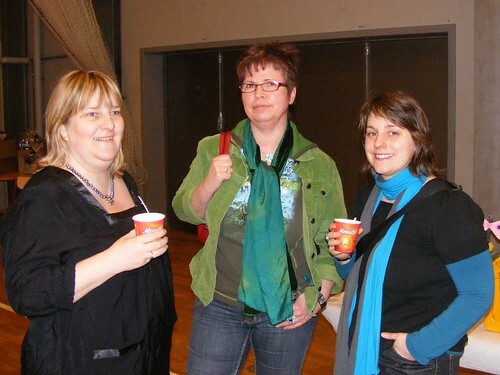 And us Teachers of the Scrapbooking Convention in Denmark – me, Christiane and Maj-Britt. Looks like a ton of fun! Loved seeing all those photos. Tfs. Oh how fun! I also love Denmark!